There is no denying the stunning beauty of a diamond. Although a diamond has a very beautiful appeal, purchasing a diamond can be very expensive. Furthermore, diamonds also have quite a few negative connotations that stem from the way that they are harvested. Fake diamonds look just as awe-inspiring as actual diamonds, except they are much less expensive. 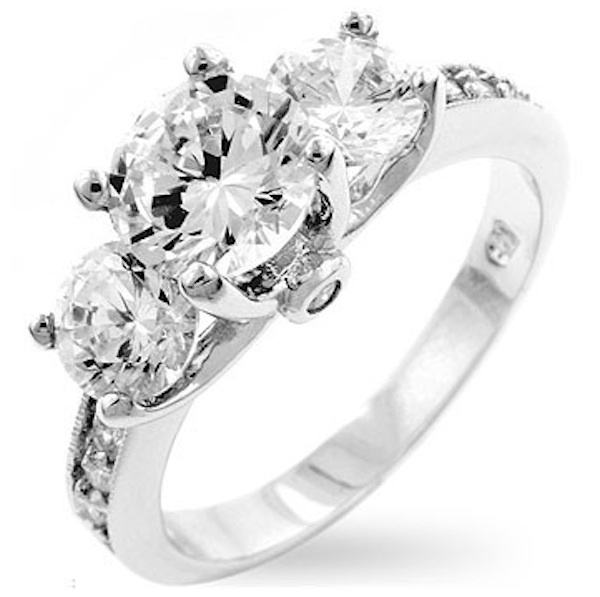 Fake diamonds can make a great piece of jewelry, like this engagement ring…. Here are some of the benefits to purchasing diamond replicas. High-quality simulated diamonds are designed with precision. In most instances, the appearance of a high-grade diamond replica is indistinguishable from a natural diamond. The cuts are so precise that the only way to truly tell the difference is by using a specialized piece of equipment. The beauty of a simulated diamond will last forever because there will not be any fading, clouding, or discoloration of the gem. The “blood diamond” controversy is very well known. The harvesting of diamonds has caused dangerous conflicts in the various parts of the world. Simulated diamonds are completely free of any conflict. Conscientious people can feel confident that their gorgeous diamond has been developed in the most ethical manner possible. The best part is that the environment is not harmed in any way. Honorable companies such as Diamonius make sure that everyone benefits from the sale of simulated diamonds. With each sale, 2.5% of the profit goes to the care of orphans. This is great news for people that are looking to help a great cause. Right now Diamonius has a Christmas special going on — Get $35 off your purchase with the Coupon Code XMAS35. very pretty, I like how some of the proceeds go to a good cause! What great deals. It is so awesome that some of that money goes to a great cause. I love companies that do that. Awesome! I chose to have a diamond free engagement ring for many reason like conflict-free and price. Thanks for sharing the discount. It’s funny because conflict-free wasn’t even on my awareness scale when I got married, but it sure is now! Diamonds are a girl’s best friend, but fake diamond’s are a wallet’s best friend! I love that you can still wear great jewelry without breaking the bank or contributing to the “blood diamond” dilemna! You said it! To many other things to spend money on than (blood) diamonds, in my book. No conflict, no blood, companies that care and a beauty of a ring! Hey .. I had the platinum and diamonds before and they turned out not as pricey afterwards. This time around, I went for stainless steel with great faux rock and my wedding set is the coolest, with the huge “rock” I’ve wanted (who can afford a 6ct real)! Besides I’d always be afraid of losing a 6ct diamond, Nadine. Who needs that kind of pressure? 🙂 Honestly, the average person can’t tell the difference if you don’t tell them. Oh so beautiful! I’d love to have that ring! Because of blood diamonds, I would never buy a real diamond again. I don’t have even one real diamond! My wedding ring was a band! I love “fake” I can get beautiful stones for a fraction of the price. I have no problem with a fake diamond who can tell the difference without a microscope anyway! I would absolutely accept a fake diamond with a smile! I think the trouble would lie in convincing my husband to purchase cubic zirconia. I have no problems with fake diamonds either. They are just as gorgeous and no one can actually tell the difference!